This new 9"x12" painting is as much about the water as it is about the duck. 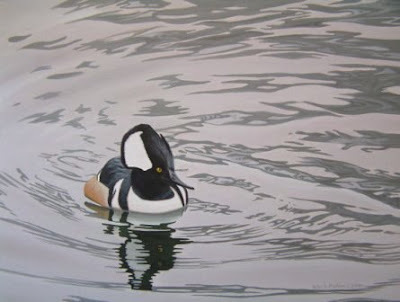 While the hooded merganser is the main focal point of the painting, I really focused on the reflections creating a subtle swirl into the duck. Incidentally, his look assists with this directional movement. It's subtle, but it's there and it's intended. I think this helps add a bit of depth as well. These three images were submitted to the Oregon Ducks Unlimited Artist of the Year competition, which is taking place today at the state convention in Hood River, OR. All are small originals and will compete with entries from other artists around the state. The winning entry will be reproduced as a limited edition print that will be a part of the DU Sponsor package. 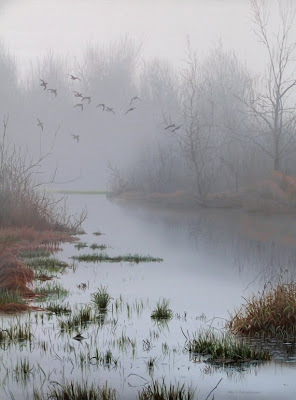 Monies raised from the package directly benefit wetland habitat, not only in Oregon, but throughout the country. I have been fortunate enough to use my art to help wildlife conservation for many years. If one of these entries is chosen I will post it on the blog. 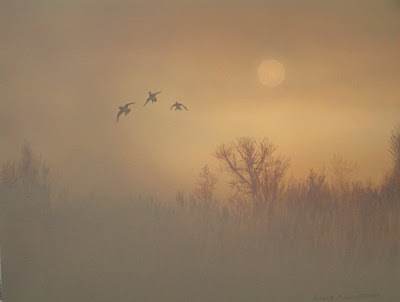 This 8"x10" painting of three mallard coming in at sunrise is along the lines of some of the more recent paintings I have been doing that are primarily a landscape with distant ducks as part of the scene. With this piece I was really going for the mood of the morning and to create the effect, a much simpler palette was used. A painting I have been working on... it's seems to be more about the reflections in the water and the movement in the water that swirls in towards the striking merganser. Here is a painting of a low-flying flock of greenwing teal. 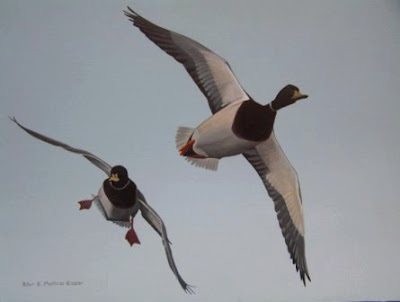 These ducks commonly fly low and fast and can surprise you if you don't see them coming. 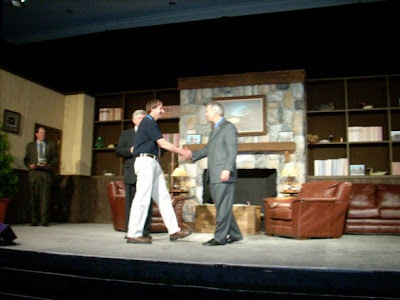 Here are some pictures from the trip to Baltimore where I received the award for winning the 2009 International Artist of the Year... It was an incredible, inspiring experience and the people involved with Ducks Unlimited are so generous and giving. It is difficult to describe how grateful my wife and I are for the experiences that Wild Wings and Ducks Unlimited shared with us. Myself and Rachelle at the sports party at Camden Yards with the incredible staff from Wild Wings - Sara, Michelle, Larry and his wife Roberta. They were so helpful and a lot of fun! The fine people from Alaska DU - keep an eye open for the upcoming Alaska print Rainy Day Respite - Pintail.